So let me introduce you to Breath Counting Meditation. 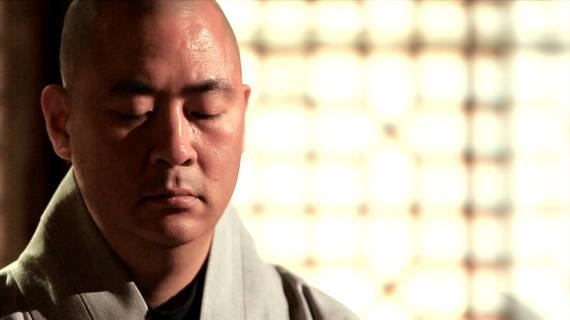 This is an ancient mental training technique traditionally used by monks to build their power of concentration. First, we have to learn Abdominal Breathing. Teacher of the Living Phrase Son Meditation of traditional Korean Buddhism and representative disciple of Son Master Songdam, the most venerated Buddhist master of Korea. You know what's funny? Nearly everything we buy or use comes with instructions. Not just cellphones and computers, but even something as simple as a hammer will usually have at least a drawing that tells you how to use it. But people are not products. We're all born with a brain and body, but at birth none of us is given a user's manual for them. Fortunately, the great Buddhist meditators of the past studied the connections between our mind, body, and external reality. They learned that with practice human beings can regulate extremely subtle psychological and physiological processes. We can control our circulatory system and our nervous system, our moods and our thoughts. We can perceive what's going on in our minds and bodies and what's going on in the universe around us. We can learn to live at a higher level of consciousness. The key to this transformation of mind and body, they discovered, is correct breathing. Breath is the link between mind and body. Breathing is one of the very few physiological processes that functions both voluntarily and involuntarily. In other words, we can consciously control it when we want to and it happens automatically when we don't. All of our emotional shifts are reflected in our breathing pattern. When we get excited, we breathe faster. When we get depressed, we sigh. When we're calm, our breathing is deep and regular. However, just as shifts in our state of mind change our breathing pattern, consciously changing our breathing method can shift our state of mind. In other words, through correct breathing technique we can learn to regulate our mind. This, in turn, means that by breathing correctly, we can learn to eradicate some of the suffering that we experience in states of fear, anxiety, rage, loneliness, and depression. It is these negative emotions and the dysfunctional behavior that they cause which hinder our personal growth and development. If we want to improve the way we live, the first thing we need to learn is how to escape emotional pain and attain a state of inner peace and clarity. When our mind is calm and clear, we see things more objectively, make decisions more wisely, and work more diligently. Sit in a stable chair that's not too pillowy. Don't lean back, sit up straight. Have your feet shoulder width apart, flat on the floor, and parallel to one another. Place the edge of your right hand, palm up, against your lower belly and allow it to rest naturally in your lap. Place your left hand, also palm up, on top of your right hand. Lightly join your thumb tips to create an elegant rainbow arc. Tuck in your chin slightly. Lightly press the tip of the tongue against the roof of your mouth just behind your upper row of teeth. Keep your eyes open and look straight ahead, but don't stare at any object or pattern in the floor. Just keep your eyes soft and relaxed. Very slowly inhale through your nose and gently push out your lower belly as if it's filling up with the air that you're inhaling. When your belly feels about 80% full, pause for about 3 seconds. Then, even more slowly exhale through your nose and gently pull in your lower belly as if you're now squeezing out the air. Inhalation should be roughly 3 seconds, the pause 3 seconds, and the longer exhalation about 4 seconds. For practice, try 5 cycles of abdominal breathing. If you're trying abdominal breathing for the very first time, it may feel a little strange and awkward. That's okay, with practice you'll get used to it. It's actually our body's natural method of breathing. Fetuses in the womb as well as newly born infants are said to breathe this way. But for some reason, as we grow up, we begin to breathe high up in our chest which is physically less efficient and tends to create a more anxious state of mind. Now let's apply abdominal breathing in Breath Counting Meditation. Assume the same physical posture as in Preparation Breathing. Engage abdominal breathing and inhale. Exhale and at the very end of your out-breath, mentally count, "One." Again, inhale, pause, exhale, and then at the end of your out-breath mentally count, "Two." Keep counting like this at the end of every exhalation until you reach "Ten." Then, starting counting backward --- nine, eight, seven, six, etc. -- until you reach "one" again. Like a game, however, there is a rule here that you have to follow: If, because of random thoughts, you even briefly forget which number you're on or hesitate, then you must start over again at "one." See if you can go all the way up to ten and back down to one again without making any mistakes. Breath Counting Meditation is a strength-building exercise for the mind. It cleanses away distracting thoughts and builds concentration power. You will know that you're building mental strength because it will become easier and easier to reach 10 and go back down to 1 again. When you can do this with ease, increase the count to 20. When that becomes easy, increase to 30. And so on. Son Buddhist masters make the intriguing claim that if you can go up to 100 and back down to 1 again consistently, then you will have developed such inner mental power that you'll be able to achieve anything in life that you set your mind to. Giving your mind daily exercise makes at least as much sense as working out your body. It only takes a little over 3 minutes to do Breath Counting Meditation to the count of 10, if you don't make a mistake. So if you're a complete beginner, maybe you can start with 5 minutes of Breath Counting Meditation every morning. As you build mental power, you may increase the count accordingly. It takes surprisingly little to completely transform our way of living. Simply adding this Breath Counting Meditation to your daily schedule can change your life. Why don't you try it and see for yourself? For further teachings regarding Son meditation practice, please refer to the Youtube channel "Hwansan Sunim: Son Meditation for the Modern World" to the Facebook page "Yonghwasa International Seon Buddhist Program." If you have questions for Hwansan Sunim, you may send an email to ask.hwansan@gmail.com.